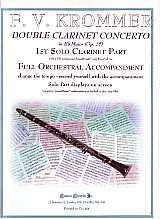 Of most interest to us, of course, are the Chamber works for the Clarinet: 13 Pieces for two Clarinets and Viola (op. 47, 1804); a Clarinet Quintet (for clarinet, violin, 2 violas & cello, op. 95); and 5 Clarinet Quartets (for clarinet, violin, viola & cello: two as op. 21 in 1802, op. 69, op. 82 in 1816 and op. 83).